Here's a couple of decorating hints for those who want to arrange a small-scale birthday party. My instructions for making party decorations were first published in the Little Enough News group on Yahoo, in August 2002. Roll a 5 mm or 3/16" (approx.) diameter ball in the palm of your hand, and turn it into a pear shape by rolling one side of the ball with the edge of your finger. Cluster the balloons as desired, adding some of other shapes too if you'd like (oblong balloons will need slightly more clay). Here and there, insert a tiny ball in the clusters, to represent balloons that have shrunk because they weren't tied off properly... If some balloons should have wires, let them cool to firm up (perhaps in the fridge) so they won't deform when you insert the wires. Harden as per manufacturer's instructions. Add a gloss coat if you'd like. Take some FrayCheck on your index fingertip and pull a few inches of thread between your thumb and index fingertips. Quickly spiral the thread around the pin (the FrayCheck will dry very quickly). The pin should show between the loops - otherwise the thread will stick together. When completely dry, carefully ease the thread coil off the pin. 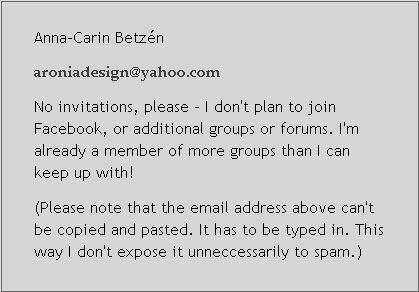 © Copyright Anna-Carin Betzén 2002, 2005. You're welcome to print the instructions or link to them, but do not copy them to repost elsewhere. This is a free project, not to be taught for profit.